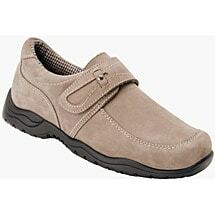 This easy-on/easy-off closed-back shoe has stylish good looks and abundant comfort. Ideal for those with hard-to-fit feet that require extra support and lots of room, the Antwerp features the Plus Fitting System® made up of two removable insoles for added or double depth and the accommodation of personal orthotics. 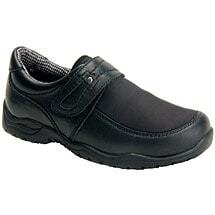 The extended medial heel stabilizer minimizes heel slippage and provides rear foot walking stability. Tempered steel shank supports the arch and enhances overall support. 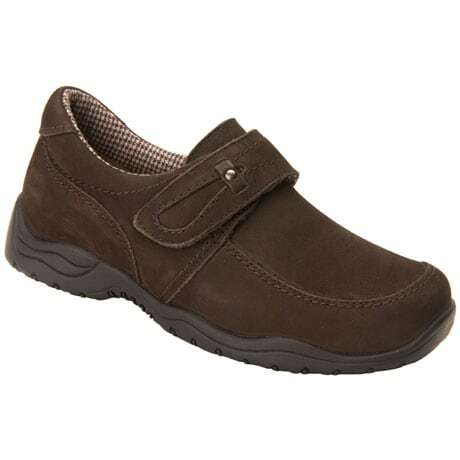 Removable polyurethane footbed with Drilex® cover adds heel cushioning while wicking moisture, leaving feet dry and comfortable. Chic Velcro® strap allows for customized fit while ultra lightweight, slip-resistant outsole allows you to step safely.